Monarch Air Group provides private air charter in Saint Louis, MO. Our clients benefit from top-notch service, unrelenting dedication to safety, wide selection of aircraft, and years of experience in chartering private jets. To obtain a free quote, please use our online quoting tool provided below, or call toll free 1-877-281-3051. Monarch Air Group offers private jet charter services to and from Saint Louis, MO, USA. Located 235 miles east of Kansas City and 105 miles east of the state capital of Jefferson City and, Saint Louis is a city in eastern Missouri, on the Mississippi River just south of its confluence with the Missouri River. 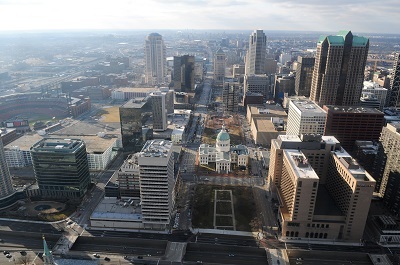 St. Louis is the second largest city in the state of Missouri, and an important financial and commercial center of the region. The St. Louis area is home to nine Fortune 500 companies, including Express Scripts, Monsanto, Ameren, Charter Communications, Emerson Electric, Graybar Electric, and Centene. The city has something for everyone, from cruising down the mighty Mississippi River to walking through the Missouri Botanical Garden. St. Louis is an important touristic centre of USA. The city is served by St Charles County Smartt Airport (SET), Lambert-St Louis International Airport (STL) and Spirit of St. Louis Airport (SUS), which provide business and leisure charter flights to travelers from all over the world. 1. ALN, Alton, Alton, United States. 2. BLV, Belleville, Belleville, United States. 3. CPS, St. Louis Downtown Airport, St Louis, Il, United States. 4. ENL, Municipal, Centralia, United States. 5. FAM, Regional, Farmington, United States. 6. FES, Festus Memorial Airport, MO, United States. 7. GRE, Municipal, Greenville, United States. 8. SAR, Sparta Community, Sparta, United States. 9. SLO, Leckrone, Salem, United States. 10. STL, Lambert-St. Louis International, St Louis, United States. 11. SUS, Spirit Of St Louis, St Louis, United States. 1. Drury Inn Union Station St. Louis, 201 South 20th Street, St. Louis. 2. Drury Plaza Hotel, 2 South 4th Street, St Louis. 3. Westin Hotel, 811 Spruce Street, St. Louis. 4. Westin Hotels & Resorts, 811 Spruce Street, St Louis. 5. Drury Inn Union Station St. Louis, 201 South 20th Street, St. Louis. 6. Sheraton St. Louis City Center Hotel & Suites, 400 South 14th Street, St. Louis. 7. St Louis Pavilion Hotel, 1 South Broadway, St. Louis. 8. Drury Plaza Hotel, 2 South 4th Street, St Louis. 9. Four Seasons St Louis, 999 North Second Street, St. Louis. 10. Drury Inn Union Station St. Louis, 201 South 20th Street, St. Louis.